Appearing in the Peninusla Clarion. 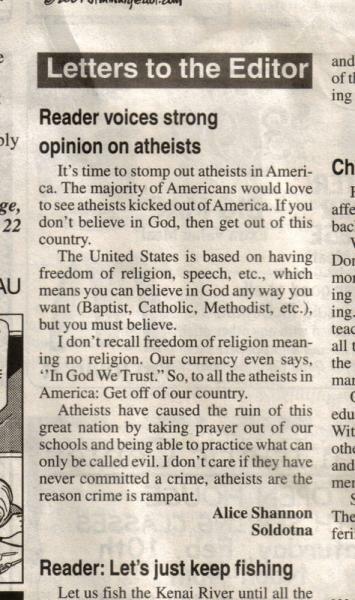 The writer demonstrates a profound misunderstanding of both the point of the first amendment and the history of ‘In God We Trust’ as a jingoistic slogan. Now I suppose it is okay for a citizen to be ignorant but for an editor to actually choose this letter for publication is simply unconscionable. See for yourself. I am deeply offended by Shannon’s bigotry, intolerance and anti-intellectualism. Her lack of knowledge and understanding regarding alternatives to faith suggests a world view that excludes cognition and rational thought rather than working toward acceptance and clarity. I am tempted to ask Alice Shannon to stay in Alaska and not wander into the lower 48 but that would be falling into her trap. How about an old fashioned face-to-face debate. Maybe that would be enlightening (pun intended).